Las Vegas (115.137W 36.175N) was a sleepy Mormon pioneer settlement until the boom accompanying the construction of the nearby Boulder Dam. Its climate is typical of the low desert of western North America: warm in the winter, broiling in the summer, and extremely dry. 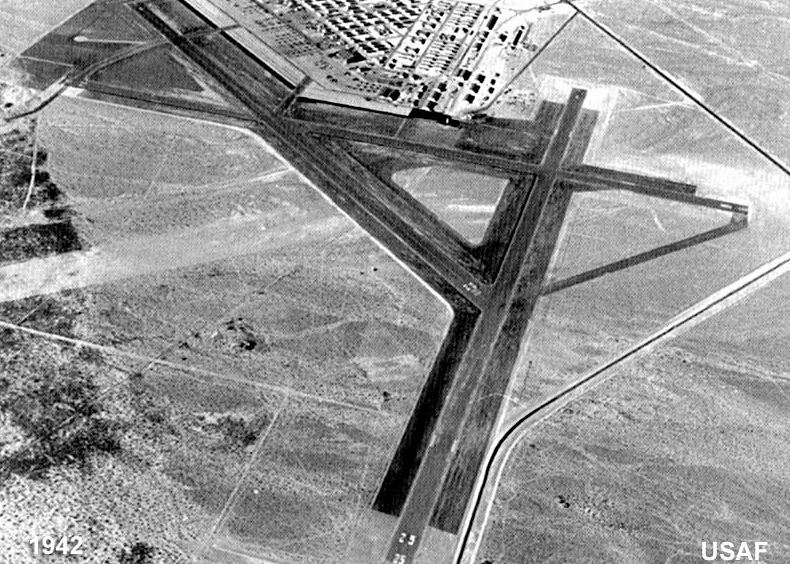 It was here that the Army Air Corps established the Flexible Gunnery School (115.024W 36.246N) to train airmen destined for duty as aerial gunners on bombers. In this respect, the Americans were ahead of most other powers, who gave their bomber airmen little formal gunnery training. Some 9,117 gunners graduated in 1942 and 18,071 in 1943, and a total of 44,246 had graduated by mid-August 1944. The government funded construction of a magnesium plant, which opened in January 1942 and drew on nearby deposits of brucite and magnesite (magnesium ores) and the power from Boulder Dam. However, the greatest growth of the city was as an entertainment center, which remains one of its chief industries today.